2019 BMW HP4 Race. Picture credits - BMW. Submit more pictures. The frame of the HP4 RACE is made of endless carbon fibre and is a continuous component from the steering head to the swing arm pivot. Compared to the standard frame, it saves a full four kilos in weight. For the BMW HP4 RACE�s carbon technology, it�s not about how it looks, but rather its characteristics. Frame type: Carbon monocoque RTM frame with steering head angle and swinging-arm pivot adjustment, load- bearing engine. Wheels: Carbon wheels including press-fitted wheel spacer bushes for easy wheel fitting. Pirelli Diabolo Superbike Slick SC2 tyres. Alternate seat height: 846 mm (33.3 inches) If adjustable, highest setting. Ask questions Join the 19 BMW HP4 Race discussion group or the general BMW discussion group. 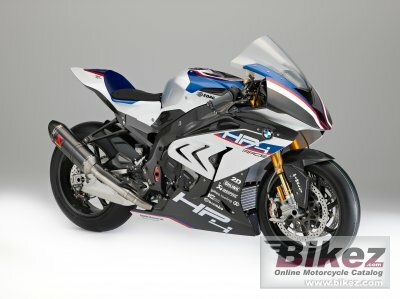 Enter your e-mail to join the 2019 BMW HP4 Race forum and get notification of answers and new messages about this bike. You can unsubscribe with a single click. Bikez does not display, sell	or misuse e-mail addresses. Get a list of related motorbikes before you buy this BMW. Inspect technical data. Look at photos. Read the riders' comments at the bike's discussion group. And check out the bike's reliability, repair costs, etc. Show any 2019 BMW HP4 Race for sale on our Bikez.biz Motorcycle Classifieds. You can also sign up for e-mail notification when such bikes are advertised in the future. And advertise your old MC for sale. Our efficient ads are free. You are also welcome to read and submit motorcycle reviews.